Zayna Achmar, who had been studying clinical psychology at the Chicago branch of Argosy University for three years, was blindsided when the college closed this month.The last days were “chaotic and emotional,” she said. Professors emptied out their offices, while students ran around trying to get their academic records. Even the library was giving away its books. None of this had been on her mind when the 32-year-old enrolled at the university years ago, hoping to get her doctorate. Several people close to her had gone to the for-profit university, and it was accredited, so she thought it was safe. Over the past semester, Argosy crumbled, it seemed, with little notice. “I am not just devastated for myself, but for the professors and everyone else affected,” Achmar said. There were warning signs, though students unfamiliar with the world of higher education may not have known where to look for them. In many cases, that unfamiliarity was what brought them to an Argosy branch in the first place. Here’s what many of them didn’t know. Most American colleges are tax-exempt. Whether they’re public or private, revenue from tuition and donations are supposed to go back into the university. Those universities often appeal to students for their ease of access and flexible hours: They often offer classes close to where students live and at night, to accommodate work schedules. They make enrolling easy andmarket to students a clear career path and a better life in an attainable time frame. They advertise with great gusto and capture attention in a way that, say, a community college can’t. They also have a reputation for high-profile closures. In 2018, the Education Corp. of America’s 75 campuses shut their doors. In 2016, ITT Technical Institute closed. In 2015, it was the for-profit Corinthian College that fell. The list goes on: More than 100,000 students have been displaced by closings of colleges chains since 2015, according to The Chronicle of Higher Education. Often, the closures came after the federal government had started monitoring the colleges’ use of student-loan money. When colleges close, students must pick up the pieces. And while they can in many cases get their federal student loan forgiven, there is no making up for lost time or the income they gave up while they were in class. It’s also unclear if other institutions will take the credits they earned. Even those who complete their programs might still find themselves at a disadvantage. Those who attend a for-profit certificate program are 1.5 percent less likely to be employed, compared with peers in a public program. The for-profit students, if they find employment, also earn 11 percent less than their counterparts, according to a study co-authored by Stephanie R. Cellini, a professor at George Washington University who studies for-profits. Research is clear, Cellini said: Students at for-profit universities take on more debt, and often the future gains don’t materialize. But those enrolled don’t seem to know that. In many cases, they don’t even know if they’re enrolled at a public or private institution. In a study by the Department of Labor, students were asked to identify if they attended a public or private university. Many failed, Cellini said, to properly identify what kind of college they attended. Students at for-profit schools also have the hardest time paying back their federal students loans. According to the Department of Education, from fall 2014 to fall 2017, 15.6 percent of for-profit students who started to repay their loans eventually defaulted. 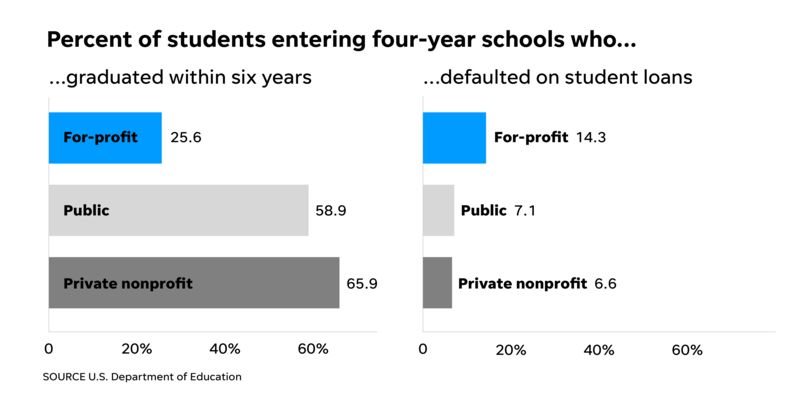 In contrast, only about 10 percent of students who went to public schools defaulted, and roughly 7 percent of private-school students. “Flexible learning,” an “affordable tiered tuition plan” and more than “$16 million in scholarships” in the past academic year, Argosy University’s website boasted as recently as Feb. 20. The site also touted nearly 101,000 graduates and small class sizes. “Perhaps your next step should be on our campus,” the site read. Argosy made a good pitch, and it made enrolling easy, too. Many for-profits forgo a drawn-out admissions process or long waits for acceptances. What’s more, for-profits offer what appear to be clear connections between degrees and jobs. That’s helpful to students who may be unfamiliar with college and the value of a traditional degree. People with a degree in English, for example, don’t work in “English.” They may be technical writers, teachers or even journalists. “There are an awful lot of kids who have no idea how to proceed,” said Guilbert Hentschke, a professor of education at the University of Southern California. Still, for-profits can fill an important need in preparing students for careers not typically associated with a traditional university education, said Steve Gunderson, president of the Association of Career Education Colleges and Universities, which are for-profit schools. His group has been pushing for an oversight group, preferably through the U.S. Department of Education, that would monitor struggling for-profits and oversee transfers of students when a for-profit suddenly closes. Some warning signs include institutions that are bleeding students or bad student outcomes, which could include low graduation rates. So what’s the best way to avoid an institution that might go belly-up? Research, said Cellini. The College Scorecard, which is run by the U.S. Department of Education, collects important metrics about universities such as their graduation rates, the average annual cost and how much students earn after graduating. It also details if the school is public, private or for-profit. Accreditation alone shouldn’t put people’s mind at ease, both Cellini and Hentschke said. Different accrediting groups have different criteria. Regional agencies tend to have stricter standards than national accrediting groups, Cellini said. In the case of Argosy, the main warning sign was out there, but harder to spot. The Argosy University branches were on the College Scoreboard’s website, but that site didn’t include the most recent information about whether the school was under financial monitoring by the Education Department. Those details live on a different part of the department’s website and require visitors to download a spreadsheet.